Civil Rights | Abolish the Corporate Government Matrix "of 1871." In the 17th century Sir Edward Coke used the Great Charter of the Liberties to establish the supremacy of Parliament, the representative of the people, as the origin of law. A number of legal scholars have made the irrelevant point that the Magna Carter protected rights of the Church, nobles, and free men who were not enserfed, a small percentage of the population in the early 13th century. We hear the same about the US Constitution–it was something the rich did for themselves. I have no sympathy for debunking human achievements that, in the end, gave ordinary people liberty. At Runnymede in 1215 no one but the armed barons had the power and audacity to make King John submit to law. The rule of law, not the rule of the sovereign or of the executive branch in Washington acceded to by a cowardly and corrupt Congress and Supreme Court, is a human achievement that grew out of the Magna Carta over the centuries, with ups and downs of course. Blackstone’s Commentaries in 1759 fed into the American Revolution and gave us the US Constitution and the Bill of Rights. The Geneva Conventions extended the rule of law to the international arena. Beginning with the Clinton Administration and rapidly accelerating with the George W. Bush and Obama regimes and Tony Blair in England, the US and UK governments have run roughshod over their accountability to law. Both the US and UK in the 21st century have gone to numerous wars illegally under the Nuremberg Standard established by the US and UK following Germany’s defeat in WWII and used to execute Germans for war crimes. The US and UK claim that unlike Germany they are immune to the very international law that they themselves established in order to punish the defeated Germans. Washington and London can bomb and murder at will, but not Germany. Both governments illegally and unconstitutionally (the UK Constitution is unwritten) spy on their citizens, and the Bush and Obama executive branches have eviscerated, with the complicity of Congress and the federal courts, the entirely of the US Constitution except for the Second Amendment, which is protected by the strong lobby of the National Rifle Association. If the gun control “progressives” have their way, nothing will be left of the US Constitution. 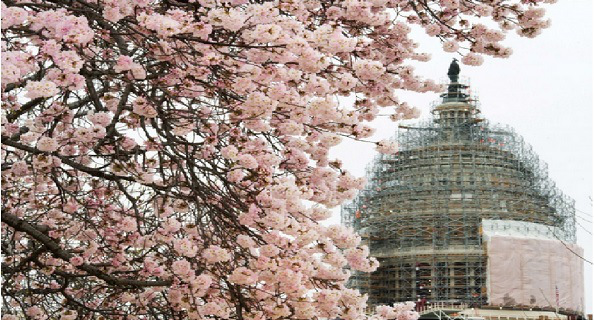 Washington and its European satellites have subordinated law to a political and economic hegemonic agenda. Just as under the heyday of colonialism when the West looted the non-white world, today the West loots its own. Greece is being looted as was Ireland, and Italy and Spain will not escape looting unless they renege on their debts and leave the EU. Western capitalism is a looting mechanism. It loots labor. It loots the environment, and with the transpacific and transatlantic “partnerships” it will loot the sovereign law of countries. For example, France’s laws against GMOs become “restraints on trade” and subjects France to punitive law suits by Monsanto. If France doesn’t pay Monsanto the damages Monsanto claims, France is subject to punitive sanctions like Washington applies to Russia when Russia doesn’t do what Washington wants. A new slave existence is being created in front of our eyes as law ceases to be a shield of peoples and becomes a weapon in the hands of government. Eight hundred years of reform is being overturned as Washington and its vassals invade, bomb, and overthrow governments that are out of step with Washington’s agenda. Formerly self-sufficient agricultural communities are becoming wage slaves for international agribusiness corporations. Everywhere privilege is rising above law and justice is being lost. The concentration of wealth and power is reminiscent of the aristocratic era and of Rome under the Caesars. The demise of the rule of law has stripped ordinary people of security and dignity. Peoples of the world must protect themselves by acting in defense of the Great Charter’s principle that governments are accountable to law. Governments unaccountable to law are tyrannies whatever they might call themselves, no matter how exceptional and indispensable they declare themselves to be. Monday in Westminster in London, the International Tribunal for Natural Justice is forming. If my understanding of this work of Humanitad is correct, we have a cause for hope. Perhaps the Tribunal will try the criminals of our time, almost all of which are “leaders” of Western governments, on the Internet with juries and prosecutors so that populations everywhere can witness the evil that every Western government represents. Once the West is perceived as the evil force that it is, it will have to reform and again embrace Edward Coke’s vision of the Great Charter or become an unimportant backwater while the rest of the world goes on to better things. The world is saved once the world ceases to bow down to the American Caesar. 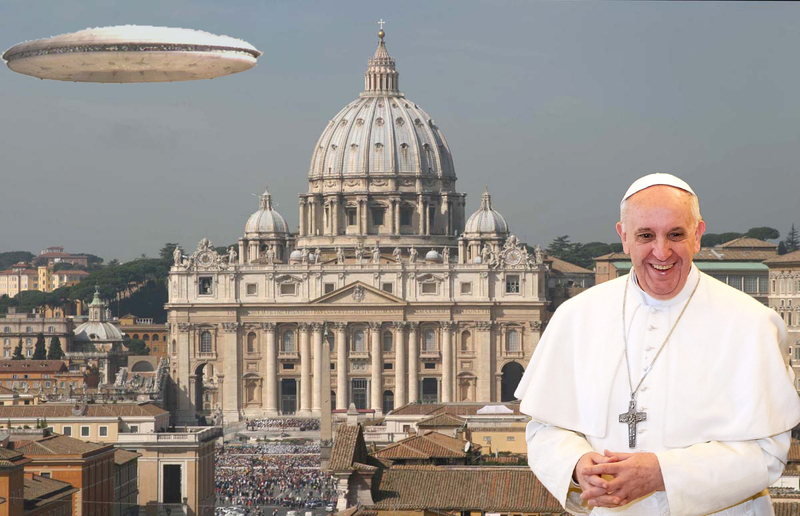 Pope Francis has said that he would be willing to baptize aliens if they came to the Vatican, asking “who are we to close doors to anyone, even Martians”. According to multiple sources within the Vatican, Pope Francis wants to avoid the long-term embarrassment that the church experienced during the time of Galileo when it was clearly revealed that the Earth was not the center of the Universe. Reportedly the Pope wants to position the Jesuit Order to incorporate a new reality which consists of the acceptance of accepting a new reality of alien existence which are telepathic and this will form the basis between humans and advanced aliens. I believe that this is what the Bible refers to as the Great Deception. The United Nations is announcing that Pope Francis will address the annual U.N. General Assembly of world leaders on Sept. 25 during his first papal visit to the United States.The pope earlier agreed to address a joint meeting of Congress on his visit. The upcoming September 24 speech will mark the first time that a Pope will address the United States Congress. Many speculate that this is where the Pope will make his move to announce his “one religion initiative” and further elaborate on his belief that mankind is about to be contacted by telepathic aliens (his words, not mine). In an interview with Famiglia Cristiana, the Pope stated that he wanted to found an international body of religions under one central authority, “An United Nations of religion“. For decades, NASA has developed space based weapons systems designed to penetrate every aspect of our lives and this plan is labeled as Operation Blue Beam. The Blue Beam Project has four different steps in order to implement a new age religion, along with the roll out of a fake Antichrist at its head. Oh, I believe that we will see an Anti-Christ, but this will not be it. We must remember that the new age religion is the very foundation for the new world government, without which religion the dictatorship of the New World Order is completely impossible. The first step in the NASA Blue Beam Project concerns the breakdown of all archaeological knowledge. We will see more and more fake discoveries of previous alien contact, where these new discoveries will finally explain to all people the error of all fundamental religious doctrines. This new false doctrine will be used to make all nations believe that their religious doctrines have been misguided for centuries. Psychological preparations for that first step have already been implemented with such things as the Star Trek TV series, the 2001 A Space Odyssey film , X Files, Falling Skies, the TV series V, and movies such as Independence Day, and District 9. All of this constitutes the psychological conditioning designed to promote a paradigm shift designed to get the public to accept an “alien” existence. 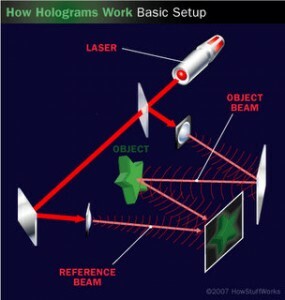 The second part of this deception is creating 3D holograms, sound and laser projections which will give way to several holographic images. As Steve Quayle and I discussed in our most recent interview, the HAARP type of technology now exists where entire battlefields can be projected and nobody would be the widers because, under these circumstances, nobody could distinguish fact from fiction. Fact or Operation Blue Beam? 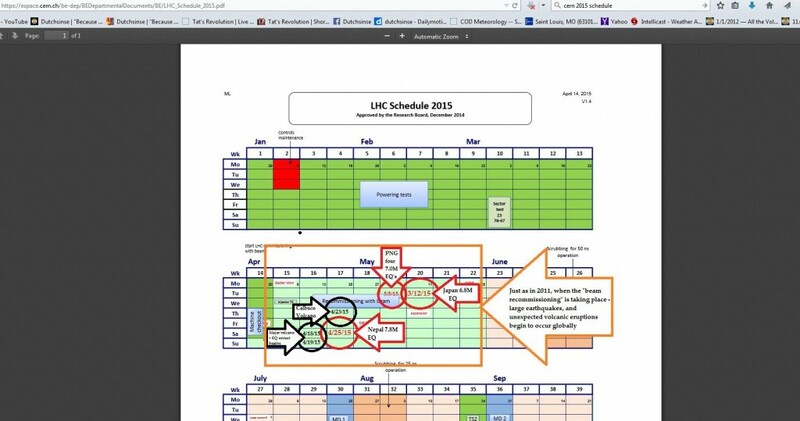 Nearly a generation ago, Nick Begichdemonstrated to the European Parliament how Project HAARP could produce fake voices inside the heads of the members of Parliament in what is known as Voice to Skull technology. 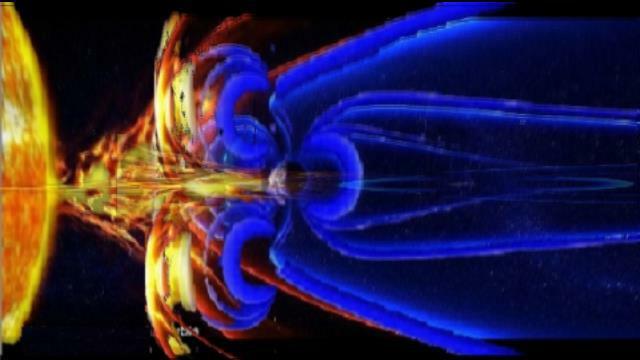 Using ELF waves, HAARP can be directly projected into the brain, causing the brain to receive messages, words, and instructions HAARP can provide a way to wipe out communications over a large area, while keeping the military’s own communications systems working. HAARP can also be used for mind control. Phase 4 culminates with mankind’s shared belief from the Great Deception, than an alien invasion is either under way, or is imminent and the only means of salvation is for a God-like figure, a holographic (i.e. a one-world religion God) will step in and “save” humanity. This will mark the beginning of a one-world government and a single Pagan religion like the one being called for the present Pope. Operation Blue Beam has some basis of support from prominent elites. Dr. Rosin recounts her four year association with Von Braun, and is she is quick to point out that he predicted that mankind would have a series of “boogey men” designed to manipulate mankind on the way to a New World Order. First, Von Braun said we would fear the Russians followed by terrorists and then we would fear asteroids and then, finally, mankind would be manipulated into believing that the earth was going to be attacked by aliens. The end game from this reign of terror would be planetary unification. Hillary Clinton was viewed at the Rockefeller Ranch holding a book by Paul Davies regarding the implications of extraterrestrial life. Interestingly, Vince Foster, friend and advisor to President Clinton, was tasked with two missions upon Bill Clinton’s election. First, find out who killed JFK. Secondly, find out the truth behind the alien question. Foster, as all will recall, committed “suicide” under some very mysterious circumstances. In 1987, Ronald Reagan addressed the United Nations and asked what would happen to the differences in and among the nations of the earth if we were attacked by a hostile alien force. This is that speech. There is enough evidence here to make most reasonable people sit up and take notice. 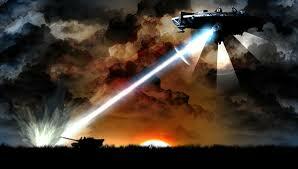 Blue Beam is a fall back doomsday plan which will be implemented when all else fails. Is the NWO desperate enough to engage in such a plot? I think it is likely that this plan will be implemented so long as other plans of unification (i.e. World War III) fail to materialize. And when and if this plan materializes, don’t believe a single word of it, no matter how real ET seems to be. Why not? Because this event fits under the Biblical category of “Rumors of War”. And when we are faced with this Great Deception, fall to your knees and collectively pray for God’s intervention and direction in your lives. 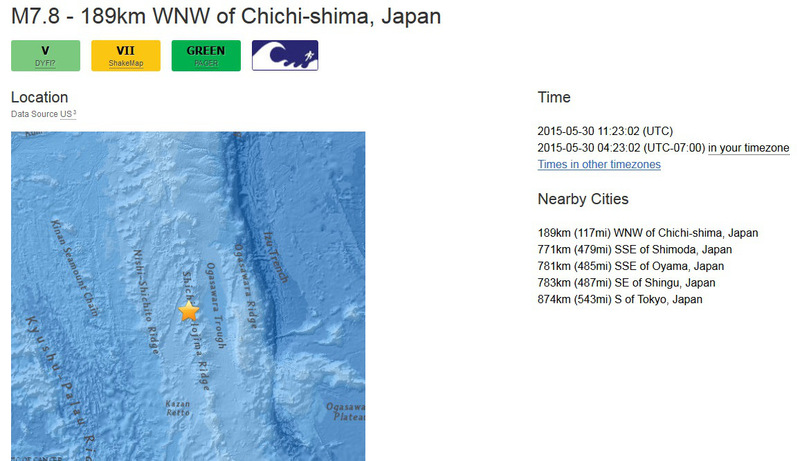 This earthquake occurred at a depth of 696km / 432 miles, which falls deep into the Asthenosphere below the Pacific plate. Worthy to note that an earthquake forecast was issued for Japan YESTERDAY, giving full warning of a very large event coming this week. 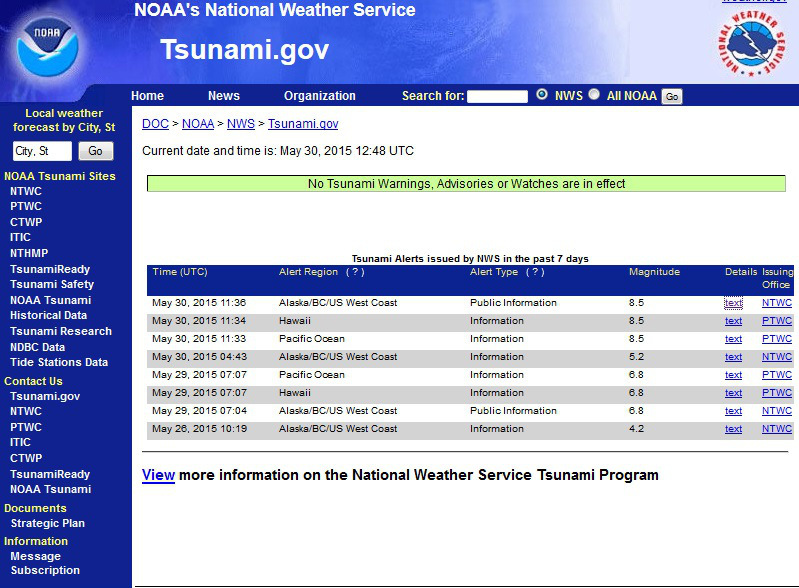 Warning issued yesterday, 8.5M strikes today. CERNS Quake Rattle Yellowstone ? 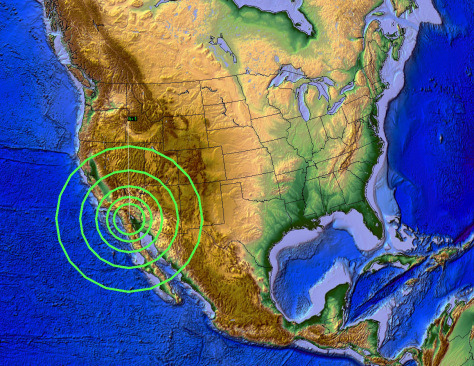 A magnitude 4.1 earthquake has struck Southern California at Salton Sea Volcanic buttes. Reports are coming in from viewers that this event was felt fairly strong in San Diego, CA. Seeing a noteworthy earthquake strike near an active volcano in Southern California is a sign of the greater global seismic unrest currently underway. It would be wise at this point (in light of the other recent Pacific earthquake activity) for the people of the West coast to at least be placed on a “watch” for possible larger movement. Even if nothing actually ends up hitting, it is better to do what the Japanese are doing right now, which is warn the population of the possibility of a larger coming earthquake. 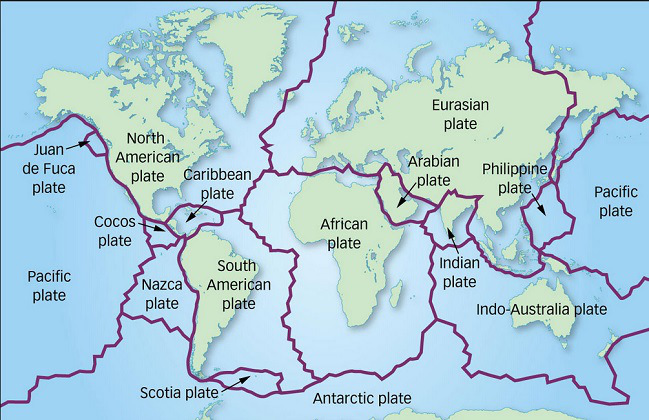 Certainly now we can all be on the same page that there IS a temporary increase in activity taking place in multiple locations globally, thus warnings should be issued for a general watch for normally earthquake prone areas, and give instructions to have a plan. 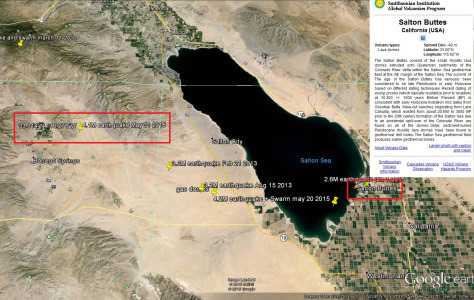 Keep in mind that this 4.1M earthquake struck at a location where “professionals” are concerned about a potential eruption — Salton Sea Volcano could erupt if earthquake / seismic conditions are right (their words not mine). The volcano was elevated to “active” status in 2011 based upon some kind of internal USGS technicality. 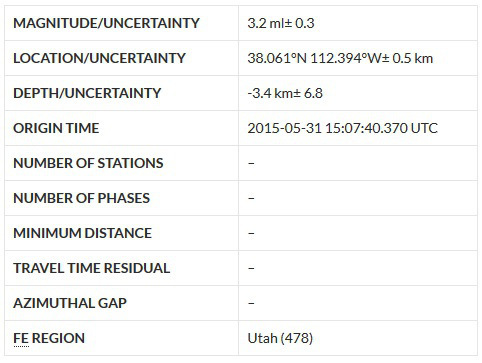 A rare magnitude 3.2 earthquake has struck South Central Utah near the dormant Markagunt volcanic plateau. 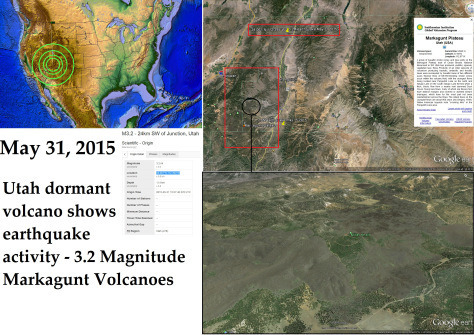 May 31, 2015 – Magnitude 3.2 earthquake strikes the Markagunt volcanic plateau in South Utah. 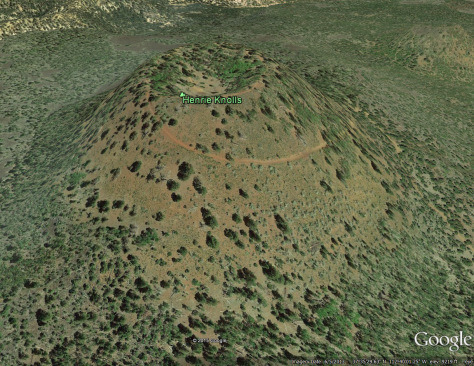 The plateau is made up of multiple lava flows which extend from a cluster of long dormant volcanic cinder cones. The obvious volcanoes stand out easily, the more weathered flows to the North (near the earthquake epicenter) are much more eroded, and hard to differentiate from the surrounding mountains. This earthquake in Utah (at a dormant volcano) immediately followed a 4.1 magnitude earthquake which struck at Salton Sea Volcano in Southern California near San Diego, CA. The Salton Sea volcanic buttes are “active” as opposed to the long dormant Markagunt volcanoes. For there to be two different earthquakes at two different volcanoes in the Southwest United states within about 2 hours time, this lets us know greater pressure is building on the West coast of the United States. The greater craton pressure is putting stress on the magma chambers of a few (so far) Southwestern United States dormant volcanoes, also pressure showing up via a series of earthquakes at the fracking operation weak points in the midwest (Illinois + Kansas). 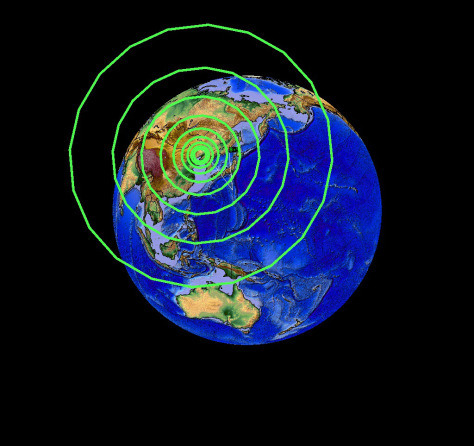 Keep watch for more activity, and at this point.. you better start looking up the coordinates of each earthquake above 3.0M on the West coast to see what resides at the location. The bright ash reflected sunlight off the landscape, and volcanic sulfur aerosols impeded solar radiation for six years, initiating an “Instant Ice Age” that — according to evidence in ice cores taken in Greenland — lasted about 1,800 years. The climactic effects of Toba have been a source of controversy for years, as is its impact on human populations. To address the limited evidence of the terrestrial effects of Toba, Ambrose and his colleagues pursued two lines of research: They analyzed pollen from a marine core in the Bay of Bengal that included a layer of ash from the Toba eruption, and they looked at carbon isotope ratios in fossil soil carbonates taken from directly above and below the Toba ash in three locations in central India. Carbon isotopes reflect the type of vegetation that existed at a given locale and time. Heavily forested regions leave carbon isotope fingerprints that are distinct from those of grasses or grassy woodlands. The carbon isotope analysis showed that forests covered central India when the eruption occurred, but wooded to open grassland predominated for at least 1,000 years after the eruption. Merdeka.com-Village Sitoluama, district Laguboti, Toba Samosir Regency, North Sumatra, restless with unusual occurrences. The soil on the side of the House residents put out hot steam like gas and pungent-smelling. The alleged harmful vapors showed up on Wednesday (27/5), the right side of the home page of Purasa, about ten kilometers from the Capital town of Balige, Toba Samosir Regency. “Hot steam like gas and pungent smells coming out of the pores of the soil it is feared to threaten the safety of local people, so we report it to the authorities,” said one resident, Purasa Silalahi on Sitoluama, Saturday (30/5). Indeed, advanced Purasa, since three weeks the temperature around her very hot, good day or night. In fact, any House floor ceramic tile feels hot. Feeling suspicious, the conditions he intends to dig into the ground next to his house as deep as 50 centimeters and turns to steam heat with a temperature of smoke had emerged from the pit quarry. Due to fear of minerals with the condition that he immediately covered pit again. “Hot steam and smells made us feel afraid of the gas that can be burned, so these findings are reported directly to the head of a local village,” explains Purasa. The village chief Sitoluama, Moppo Old Pangaribuan said, hot steam that is troubling the citizens it has reported to the environmental protection agency of Toba Samosir. The use, on its territory there has been research on 20 years ago and there is a sign or a PIN that there is oil in the area. 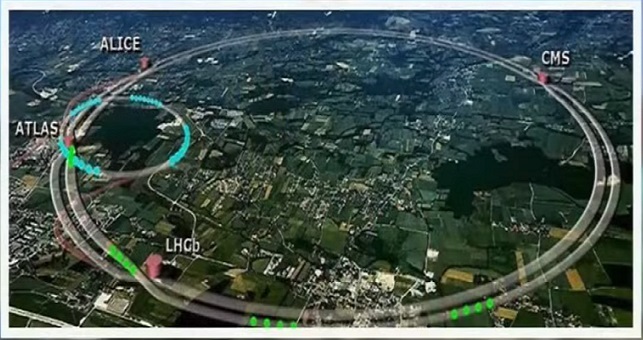 “First there was the research in this area. But the results to date there has been no certainty and now all of a sudden appear in the form of gas. We hope relevant agencies can examine repeated for convenience of society, “said Mappo. Meanwhile, the Head of the environmental agency of Toba Samosir, Parulian Siregar said, his side has continued to report the discovery of the citizens over the discovery of the hot steam that is troubling. “We tried to coordinate with the Central Department of mines and energy of North Sumatra as well as the relevant parties to know for sure the source of steam, including handling solutions,” Parulian said. A supervolcanic eruption thought to have nearly driven humanity extinct may not have endangered the species after all, a new investigation suggests. Supervolcanoes are capable of eruptions dwarfing anything ever seen in recorded history, expelling thousands of times more magma and ash than even a Mount St. Helens or Pinatubo. A supervolcanic eruption could wreak as much havoc as the impact of a mile-wide asteroid,by blotting out the sun with ash, reflecting its rays and cooling the Earth — a phenomenon called a “volcanic winter.” A dozen or so supervolcanoes exist today, some of them lying at the bottom of the sea. The largest supervolcano eruption of the past 2.5 million years was a series of explosions of Mount Toba on the Indonesian island of Sumatra about 75,000 years ago. Researchers say Toba spewed out a staggering 700 cubic miles (2,800 cubic kilometers) of magma, equivalent in mass to more than 19 million Empire State Buildings. By comparison, the infamous blast from the volcanic Indonesian island of Krakatoa in 1883, one of the largest eruptions in recorded history, released about 3 cubic miles (12 cubic km) of magma. However, recently scientists have suggested that Toba did not sway the course of human history as much as previously thought. For instance, prehistoric artifacts discovered in India and dating from after the eruption hinted that people coped fairly well with any effects of the eruption. Now researchers have found that the evidence shows Toba didn’t actually cause a volcanic winter in East Africa where humans dwelled. “We have been able to show that the largest volcanic eruption of the last two million years did not significantly alter the climate of East Africa,” said researcher Christine Lane, a geologist at the University of Oxford. Lane and her colleagues examined ash from Toba recovered from mud extracted from two sites at the bottom of Lake Malawi, the second largest lake in the East African Rift Valley. Their analysis discovered that a thin layer of ash in this sediment about 90 feet (27 m) below the lake floor was from the last of the Toba eruptions, known as Youngest Toba Tuff. The amount of ash found in the Malawi sediment core (a cylindrical log of sediment drilled from the ground), was more than the scientists expected to find. If the area had seen dramatic cooling because of all the ash spewed into the atmosphere, living matter near the lake surface would likely have died off, significantly altering the composition of the lake’s mud. However, when the researchers investigated algae and other organic matter from the layer that contained the ash from Toba, they saw no evidence of a significant temperature drop in East Africa. Apparently, “the environment very quickly recovered from any atmospheric disturbance that may have occurred,” Lane said. But these results, detailed online April 29 in the journal Proceedings of the National Academy of Sciences, don’t mean that super-eruptions aren’t as big a risk to Earth’s denizens as previously suggested. As for what might explain the near-extinction humanity apparently once experienced, perhaps another kind of catastrophe, such as disease, hit the species. It may also be possible that such a disaster never happened in the first place — genetic research suggests modern humans descend from a single population of a few thousand survivors of a calamity, but another possible explanation is that modern humans descend from a few groups that left Africa at different times. 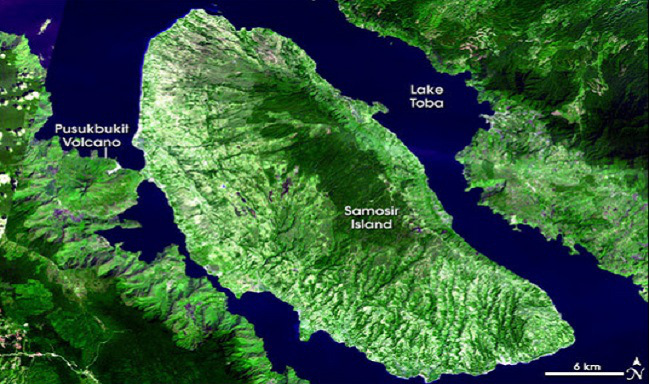 Future research will analyze what effects Toba may or may not have had on other lakes in East Africa. “Whilst from this we can hypothesize that the global climatic impact was not as dramatic as some have suggested, we will need to find similarly high-resolution records of past climate from other regions that also contain Youngest Toba Tuff in order to definitively test this,” Lane said. What would happen if the supervolcano at Yellowstone National Park suddenly erupted? It’s a terrifying thought, to say the least. The eruptions of supervolcanoes are thousands of times larger and more powerful than normal volcanoes. Though there are very few known supervolcanoes on Earth — the one that exists under Yellowstone National Park is one of the most researched and well-documented. 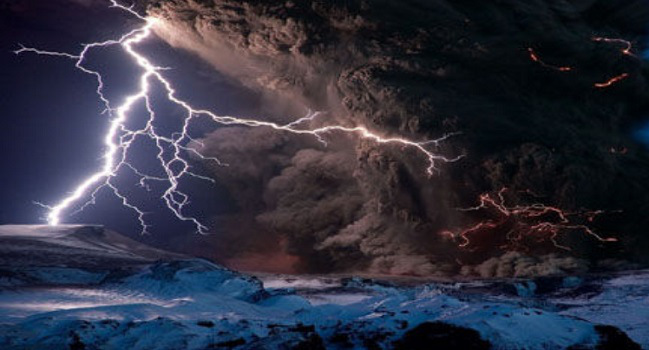 This supervolcano erupted three times in the distant past, with the last known caldera-forming supereruption occurring about 640,000 years ago. 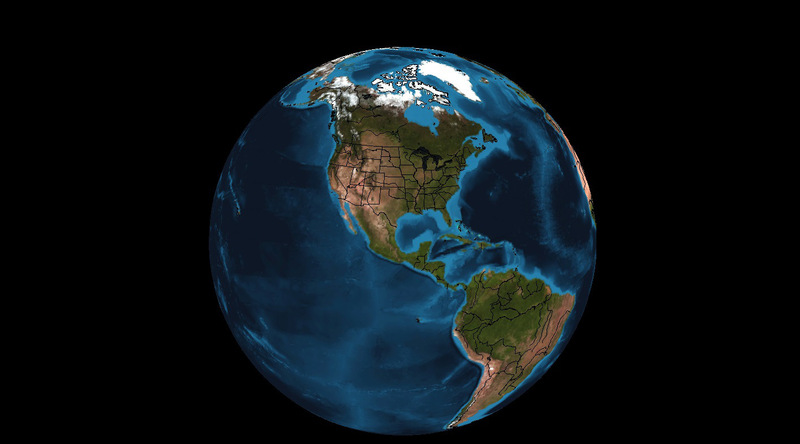 Each eruption drastically altered the North American geological landscape and had far-reaching impacts felt across the world. But according to Dr. Shannon Kobs Nawotniak, a volcanologist and assistant professor with the Department of Geosciences at Idaho State University, it’s difficult to know exactly what a supervolcano eruption would look like. 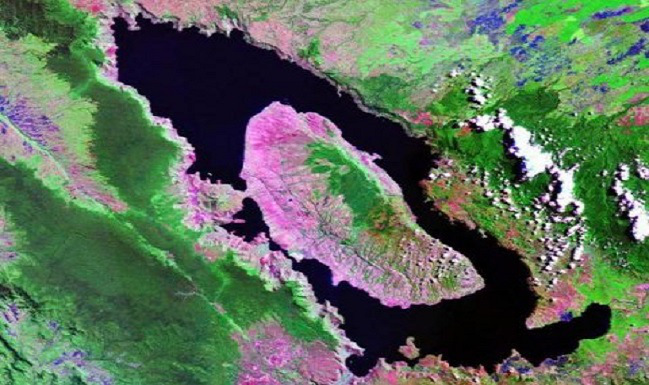 The last time a supervolcano erupted anywhere on Earth was approximately 70,000 years ago in Lake Toba on the Indonesian island of Sumatra. This event is believed to have killed most of the humans beings living on the planet at the time. But historians and archeologists have never uncovered any human record of the eruption from that time period. Without human documentation, geologists have had to use geological records and scientific research to piece together the events that occurred in Yellowstone 640,000 years ago. Last month, the Associated Press reported scientists discovered a massive magma chamber underneath the supervolcano large enough to fill the Grand Canyon 11 times over. This new discovery was important because it gives researchers a better understanding of the park’s volcanic plumbing system. With each new discovery, scientists get closer to fully understanding the mysteries of Yellowstone’s supervolcano and what to expect from a supereruption. According to Jake Lowenstern, the scientist-in-charge of the Yellowstone Volcano Observatory, the buildup to any volcanic eruption could take weeks, months or even years. Some eruptions are quick, but some can take decades. But the warning signs of an eruption of the Yellowstone Caldera would be apparent. Scientists at the observatory, which closely monitors the park’s volcanic system, would be the first to see the signs. Dr. Mike McCurry, a volcanologist and professor at ISU’s Department of Geosciences, said Yellowstone would go through an “unzipping” process before a supereruption. Massive rifts would start to form in the park, and lava reservoirs would move to the surface, some potentially as large as 30 miles across. Judging from evidence from the last supereruption, this violent movement in the Earth would be concluded by a massive eruption. The explosion would send molten rock and debris in every direction, killing and destroying everything within a 50-mile radius. The sound of the explosion would be among the loudest sounds ever heard. From Southeast Idaho’s perspective, Nawotniak and McCurry said the eruption would look like a giant mushroom cloud filling the northern sky. Pocatello and the surrounding areas would likely be far enough away to survive the blast. But for Southeast Idaho and the rest of the world, the worst would be yet to come. When the Yellowstone Caldera last erupted, it sent so much volcanic ash into the air it blanketed lands as far east as the Mississippi River. Scientists saw the impact of volcanic ash firsthand in 1980 after the eruption of Mount St. Helens. Nawotniak said the ash from that volcanic eruption circled the globe twice in 14 days, and towns surrounding the volcano in Washington state were put at a standstill because of the ashfall. But the volcanic ash produced from Mount St. Helens is just a fraction of what a supereruption would produce. Nawotniak said the eruption in 1980 ejected about 0.07 cubic miles of ash. But the ash from the last supereruption in Yellowstone is estimated to have ejected over 240 cubic miles of ash. If the Yellowstone Caldera suddenly blew, residents in Southeast Idaho would have a short time before the area became inundated with ash, so a quick escape to safer ground might be possible after the eruption. Unlike the ash produced from small fires, the ash produced by a supervolcano would be filled with minuscule fragments of jagged rocks. This would clog up and severely damage all the machines in the area, grounding all airplanes and likely destroying automobile engines. With mechanical vehicles at a standstill, attempts at an escape or a rescue would likely fail. With aviation and rescue vehicles unable to get in or out of the area, the stranded Southeast Idaho residents who did not have access to clean water or prepackaged food would be facing a dire life and death situation. But Southeast Idaho would not be the only place dealing with the disastrous aftermath of a Yellowstone supereruption. If the previous supereruption is any indication, much of the country’s grain belt in the American Midwest would be covered in ash as well. The ash would likely destroy most of the crops and livestock, which could lead to a famine and cause devastating economic consequences the world over. But once the ash gets into the atmosphere and begins to circle the globe, it could hinder or completely block out sunlight for many years in areas across the world. Historians have already seen a similar event occur within the past two centuries. In 1815, Mount Tambora in the Dutch East Indies erupted. At the time, it was the most powerful volcanic eruption seen on Earth in at least 1,300 years. The Northern Hemisphere witnessed a volcanic winter the following year, as ash deposits settled in the world’s atmosphere and hindered sunlight. The effects of Mount Tambora’s eruption were felt in 1816 (nicknamed “The Year Without a Summer”). During that time, the average global temperature dropped between 0.7 and 1.3 degrees Fahrenheit, and farmers in North America and Europe dealt with massive crop failures, leading to widespread hunger and economic disaster. In the aftermath of another Yellowstone supereruption, the world could have another so-called Year Without a Summer but on a more massive and destructive scale. What are the odds of another supereruption occurring at Yellowstone in our lifetime? According to scientists, the odds are astronomically small. “I’d be more concerned about getting killed crossing the street,” McCurry said. But the small odds haven’t curbed the public’s fascination with the Yellowstone Caldera and supervolcanoes. Every year, millions of visitors from around the world travel to northwest Wyoming to see the geysers, the lakes and all the other unique natural features that are byproducts of the cataclysmic eruption that occurred hundreds of thousands of years ago. The supervolcano has even entered the realm of pop culture. The doomsday film “2012” depicted a Yellowstone Caldera eruption and its disastrous effects, while the National Geographic Channel and PBS have aired numerous documentaries on the subject during the past 10 years. But there has also been a downside to the growing awareness of the park’s volcanic history. Every report of an earthquake or sudden geological change in the landscape in Yellowstone brings fears of an impending supereruption. “Yes, the land changes at Yellowstone quite frequently, but that’s perfectly normal,” McCurry said. In April 2014, the Associated Press said the National Park Service was fighting rumors of a possible supereruption after a video depicting bison allegedly running away from the supervolcano appeared on YouTube. However, a parks spokesman said the animals were actually running toward the park’s interior and the volcano. But Nawotniak and McCurry said widespread fears of an impending supereruption could scare tourists away from Yellowstone National Park, thus causing an economic depression in the region. There were fears that the Long Valley Caldera in eastern California was going to erupt after a strong earthquake swarm occurred in May 1980. However, the eruption never occurred, but the fears scared tourists away and caused a negative economic impact in area towns. Nawotniak said she has had to reassure local residents at times that it is safe to visit Yellowstone. “Luckily, the more dangerous the natural disaster, the less likely it’s going to happen,” she said. Thank You for reading and watching. “LET FREEDOM RING” God Bless us all. 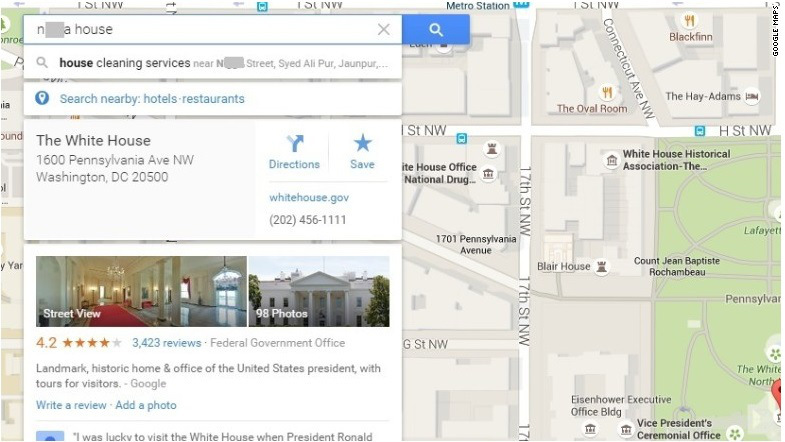 Google is fixing an issue with its Google Maps search function, which currently leads people to The White House if they search for variations of the n-word with the word house. Multiple media outlets, including the Washington Post and the Huffington Post, reported the issue Tuesday afternoon after a Twitter user first posted a screen shot of the problem. “Some inappropriate results are surfacing in Google Maps that should not be, and we apologize for any offense this may have caused,” a Google spokeswoman said in an email statement. The reason for the problem is unclear, but one search expert thinks it’s likely due to how Google links certain phrases and terms to locations on the map. “What we think is the cause, is that Google is seeing how people are talking about places on blogs, and Google’s making those associations,” Danny Sullivan, the notable founding editor of Search Engine Land, told CNNMoney. Sullivan says this isn’t a problem where someone overtly made this search query redirect to The White House. This is the second major Google Maps issue in the past two months. In April, someone discovered an illustration of an Android robot peeing on an Apple logo in a rural area of Pakistan. Google suspended its public Map Maker tool and started to review every submission manually after the incident. Tsk, tsk. It was too much of a good thing. Starting on Tuesday, Google is suspending its public Map Maker tool — preventing its community of users from independently adding landmarks and helpful tips to Google Maps. The reason? There are too many pranksters out there. Until recently, a loyal community amateur cartographers routinely edited Google Maps with little oversight. But after someone created a fake park in Pakistan — in the shape of an Android robot peeing on an Apple logo — Google imposed a strict review process. The company started to manually review every submission. But Google (GOOGL, Tech30) now says it can’t handle the deluge of work coming in. Pavithra Kanakarajan, a member of the company’s Google Maps team, explained the situation in a blog post Friday. Kanakarajan said “the most recent incident” — likely the peeing Android robot — came from “a strong user in our community.” That explains why no one noticed the image sooner. In the old system, Google mappers edited fellow mappers. Prolific contributors gained enough trust that their submissions were no longer subject to public review before going live. And these map edits were most likely in rural areas. After all, Google created Map Maker in 2011 to improve the accuracy of its popular tool. Locals know if a highway is a one-way road, or if there’s a small lake. That’s especially true in rural regions that don’t get analyzed often by satellites in space. That peeing Android robot was created as a fake park in the outskirts of Rawalpindi, a Pakistani city less than 10 miles southwest of Islamabad. A Google spokesperson said some users have been creating “all kinds of map pranks,” such as fake highway exits. But Google isn’t saying who this mysterious map editor was — or when the map editing tool might come back. Your Birth Certificate Was Made Into a Bond…it’s Worth Billions! 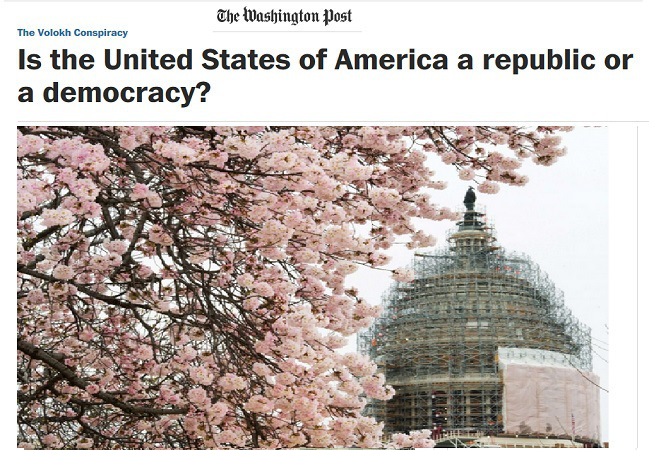 The United States is not a direct democracy, in the sense of a country in which laws (and other government decisions) are made predominantly by majority vote. Some lawmaking is done this way, on the state and local levels, but it’s only a tiny fraction of all lawmaking. But we are a representative democracy, which is a form of democracy. American statesmen and legal commentators from the Framing on. It’s true that some Framing-era commentators made arguments that distinguished “democracy” and “republic”; see, for instance, The Federalist (No. 10), though even that first draws the distinction between “pure democracy” and a “republic,” only later just saying “democracy.” But even in that era, “representative democracy” was understood as a form of democracy, alongside “pure democracy”: John Adams used the term “representative democracy” in 1794; so did Noah Webster in 1785; so did St. George Tucker in his 1803 edition of Blackstone; so did Thomas Jefferson in 1815. Tucker’s Blackstone likewise uses “democracy” to describe a representative democracy, even when the qualifier “representative” is omitted. To be sure, in addition to being a representative democracy, the United States is also a constitutional democracy, in which courts restrain in some measure the democratic will. And the United States is therefore also a constitutional republic. 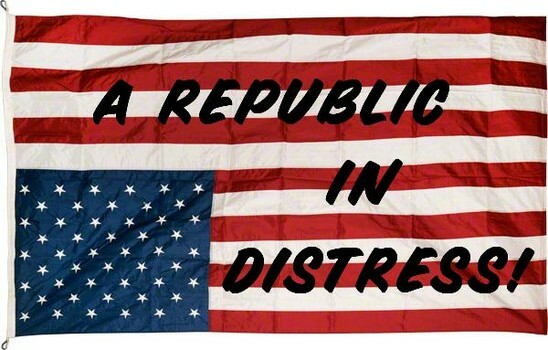 Indeed, the United States might be labeled a constitutional federal representative democracy. But where one word is used, with all the oversimplification that this necessary entails, “democracy” and “republic” both work. Indeed, since direct democracy — again, a government in which all or most laws are made by direct popular vote — would be impractical given the number and complexity of laws that pretty much any state or national government is expected to enact, it’s unsurprising that the qualifier “representative” would often be omitted. Practically speaking, representative democracy is the only democracy that’s around at any state or national level. Now one can certainly argue that some aspects of U.S. government should become less direct, and filtered through more layers of representation. One can argue, for instance, that the 17th Amendment should be repealed, and that U.S. senators should no longer be elected directly by the people, but should return to being elected by state legislators who are elected by the people. Or one can argue for repealing state- and local-level initiative and referendum schemes. Or one can argue for making the Electoral College into a deliberative body, in which the electors are supposed to discuss the candidates and make various political deals, rather than being elected solely to vote for particular candidates. And of course one can equally argue for making some aspects of U.S. government more direct, for instance by shifting to truly direct election of the president, or by institute a federal-level initiative and referendum. Grant HERMES is reporting on the scene from the Waco Texas , Twin Peaks, BIKER BRAWL between the Cossacks , Scimitars, Leathernecks, and the Bandidos… 9 killed 18 injured. Biker Brawl? Waco? Twin Peaks? Bandidos, Scimitars, Leathernecks + Cossacks biker gangs???? So we have the “ONE %” + “Marines” verses “RUSSIA” who is allied with Middle East? 9 killed and 18 injured. And a quote from the police captain ..
What happened 35 years ago today? The peak of Mount Saint Helens in Washington State blew. 1. How did a country founded on Christian principles become so apostate? The comprehensive answer to this question has many contributing factors. However, there is one in particular that should enrage anyone who has affection for either this country or the souls of its progeny. That is the systematic teaching of evolution in a manner that tears down the faith of young minds through the use of clever arguments based on lies and distorted interpretations of the facts. To be clear, an honest and sincere examination of all theories of origins is scientifically acceptable. In so doing, truth will fall where it should fall. However, the facts presented in current teachings are tortured to fit a theory that is irrational and in many cases, conflicts with known facts and laws of genetics, as well as direct observation. And as far as the separation of church and state goes: if it is acceptable to teach a theory implying that a religiously held belief is perhaps incorrect, then teaching another theory that supports a religiously held belief may be correct should also be acceptable. After all, schools in America should not exist to promote one ideology over another. They should exist to promote academic education, which never thrives in the face of censorship. 2. Where is the outrage? To those that claim to have found peace with the theory of evolution by coming to the conclusion that God could have brought everything into existence through evolution: that is NOT what His Word tells us. 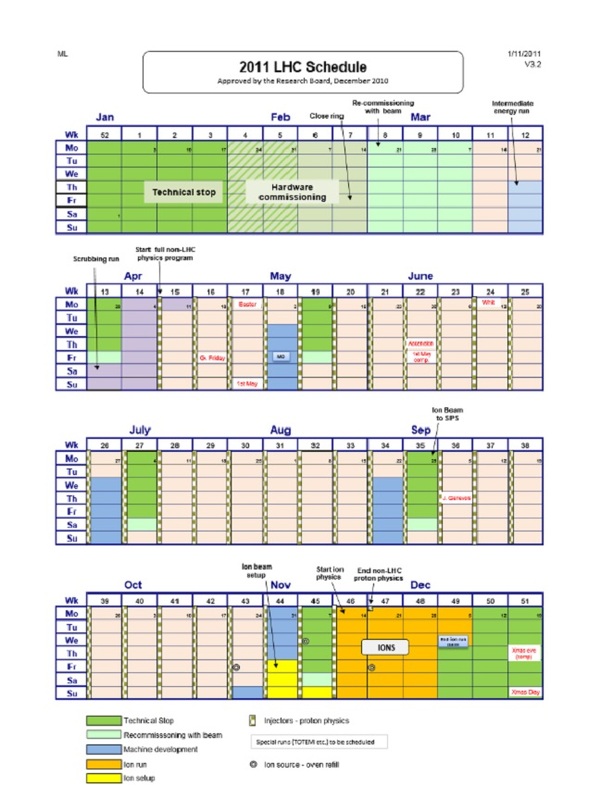 His Word tells us that He created everything in six days – and a scholarly translation of those six days means a literal 24-hour period and not six days composed of thousands of years. Our children very clearly understand that if evolution is true then God is either a liar or non-existent. Science through the use of evolution tries to answer that question. Therefore, since this is perhaps one of the most important questions a human being can ask themselves, an honest presentation of science is paramount. It affects the way a human being may live, which also affects the culture in which that human may live. Part IV of this commentary on Pearson/Prentice Hall’s Biology 2006 textbook by Miller and Levine will concentrate on embryology, imagined by several people in the distant past but first made popular by Ernest Haeckel. Darwin also had something to say about the necessary similarities of embryos that his theory pre-supposed. Ernst Haeckel, a contemporary of Darwin, ran with this concept and drew diagrams of selected animals to demonstrate this commonality. Background: in order for embryology (the study of the growth and development of embryos from conception to birth) to support evolution, Darwin and Haeckel claimed that the evolutionary history of vertebrate species can be seen in its embryonic stages. In other words, invertebrate animals go through the same stages of development as their predecessors and in so doing, repeat the embryonic stages of their evolutionary predecessors before developing into their evolved stage. Haeckel went so far as to create a very scientific-sounding name for his theory. He called it “ontogeny recapitulates phylogeny”: “ontogeny” meaning changes in growth and development patterns and “phylogeny” meaning the evolutionary history of a species, and “recapitulates” being somewhat repetitive and meaning that during the embryonic period of an animal’s life, it repeats the development stages of its evolutionary ancestor. Both Haeckel and Darwin believed that this was evidence that these species shared a common ancestor. But are the early stages, or embryos, of many animals with backbones similar, as the book claims? This statement is more than misleading. To be kind, I will say it is disingenuous. Not only was Haeckel exposed as a fraud during his lifetime because the drawings he produced were altered to fit his theory, but he also handpicked embryos that happened to look somewhat similar and concluded that all vertebrate embryos at the earliest stages of development appear to be similar. For example, he disregarded the images of fishes and amphibians within their own classification that looked significantly different and at the earliest stages of development. Disregarding any examples that contradict your theory does not qualify as including all! There is a point in development where some embryos look similar but that is for a very brief period and not at the early stages, as claimed and as would be expected. From the time of conception and as the cell divides, the stages of development are extremely different. Additionally, the features that look similar turn out to develop into very different organs for very different functions. In other words, Haeckel chose the examples that best fit his theory and artistically altered them. Then he disregarded the many examples that contradicted his theory. Of course, students are not told that the differences are evident in the early stages of development, as well as the cell movements from the time of fertility through mature development. Today some biology books still go as far as telling students that the folds in the neck areas of embryos represent gill slits that are evidence of our early stages of evolutionary development – in spite of the fact that we now know that these folds are called pharyngeal “clefs” or “pouches” and develop into the inner ear and parathyroid gland in other species – including humans! The problems that genetics present for this position are also ignored, including the fact that DNA and RNA prevent the reproduction of any species with another species, which if thought through the theory presumes. In other words, if different species developed at different embryological stages, that new species would not be able to reproduce unless another new species of the same kind developed at the same time and in the same geographic location and somehow they managed to connect. Genetics also dictates that from conception onward, the genetic codes of each species is very specific and only in rare occasions will it allow for hybrid reproductions, which usually are sterile and do not happen naturally . Regardless of the evidence, the iconographic pictures of altered embryos remains one of evolutions strongest arguments for common ancestry and some version of these continue to appear in this textbook as well as others. Why? Why would textbooks keep regurgitating failed theories when they state that support for these failed theories exist? If that were true, why would they not present the successful and perfected theories instead? This textbook does the same when it comes to the Miller-Urey experiments, discussed in Part 2 of this series. 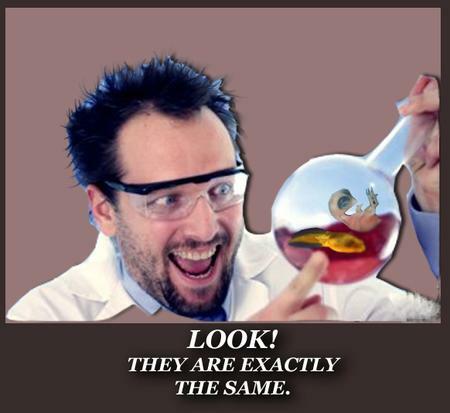 It presents the failed theory and/or experiment, states that other successful experiments and/or theories exist to support it, but then neglects to present those theories. “The iconography of persuasion strikes even closer than words to the core of our being. And I would like to add: when pictures appear in textbooks and are presented by a teacher in a classroom with all kinds of scientific-sounding assertions, the authority of their word prevails against the undeveloped critical thinking skills of students. To make matters worse, parents all over the world have neglected their biblical directive to personally educate their children (see Prov. 24:3ff) and the secularists have been more than happy to fill in the gap. Yet we dare to wonder how a country founded on Christian principles became so apostate? There is no mystery here – just an honest look at classrooms across America and their textbooks provide the answer. 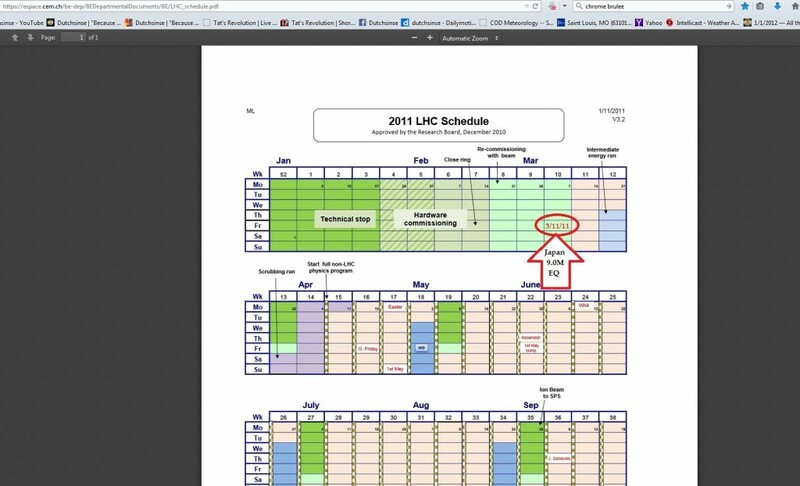 Question from TPATH to RoseAnn: Please understand that I am not disputing your statement regarding the true intent and meaning of the the length of a day as you described at the beginning of this PART IV. However, as there any other reference in the Old or New Testament that will confirm that statement? This question was inspired by the written accounts that Moses lived beyond 500 years of age. 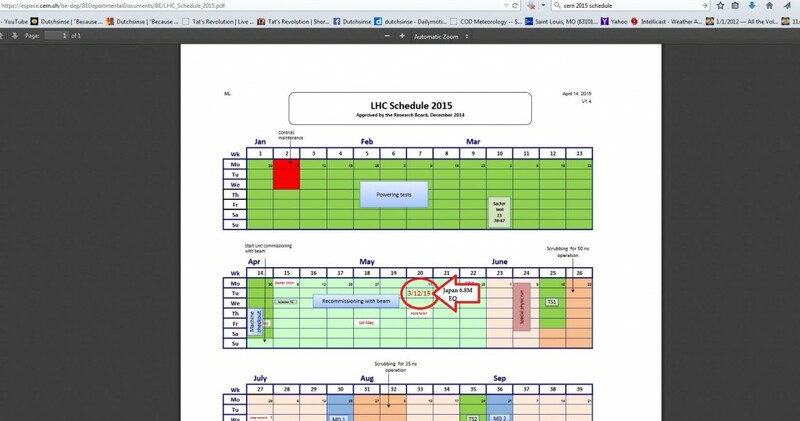 Could this have been or is there a misconception in the actual length of a year, a day, etc. ?